CAMBRIDGE – Never has the name of a theatrical troupe been more apt. The troupe, under the auspices of the Nora Theatre Company, has been performing “Twelfth Night” in repertory with “What You Will” – essentially a more stylized version of the same piece – since June 10, and the final performances are this week, ending July 10. In a recent production of “Twelfth Night” – the show reviewed here – Bedlam’s five-member company performed 13 major roles. In the company’s award-winning production of “Saint Joan,” Bedlam provided more of a road map to who was playing who, and Andrus Nichols portrayed only the title role. Here they are again, being clever – almost too clever – as they perform theatrical three-card monte as you try to figure out who’s on first, Shakespeare-style, as the players continually shuffle the deck. The plot of “Twelfth Night” involves cross-gender hijinks such as women playing men – which Bedlam promptly stands on its head, with the men playing the women playing the men, and women playing male characters. If you’re not careful, you’ll get a Popsicle headache trying to keep up with the players. Music is central to this “Twelth Night.” Text passages become folksy tunes with the guitar and song stylings of cast member Tom O’Keefe. 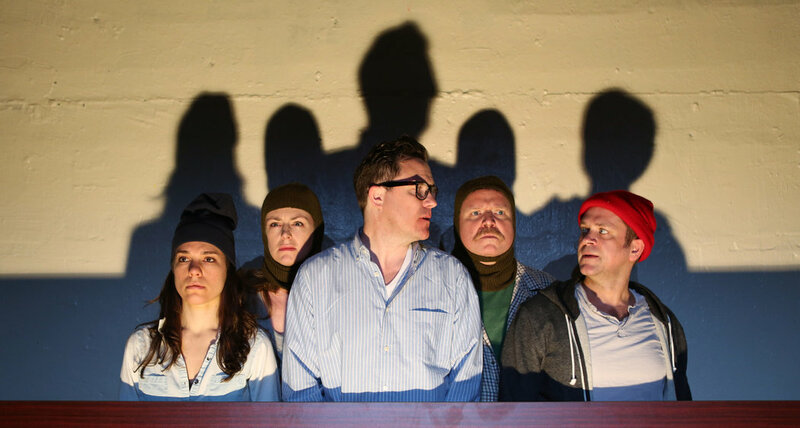 Bedlam’s artistic director and the director and ringmaster of both productions, Eric Tucker, and other company members – Edmund Lewis, Kelley Curran and Susannah Millonzi – are not above making flippant comments or jumping off text to make a point or get a laugh. The plot centers around Viola, who has been shipwrecked in a violent storm off the coast of Illyria; in the process she has lost her twin brother, Sebastian. She disguises herself as a boy and assumes the name Cesario for protection. Thus disguised, Viola becomes a page in the service of Orsino, the Duke. It seems that Orsino is having little luck courting Olivia, who is in mourning for the deaths of her father and brother. As Orsino’s proxy, Viola is sent to Olivia with love letters. Viola refuses to budge until she is let in to see Olivia; Olivia, intrigued by the impudent young “boy,” contrives to get “Cesario” to return by sending her steward, Malvolio, after her with one of Olivia’s rings. Viola realizes to her dismay that Olivia has fallen for her Cesario rather than Duke Orsino —further complicated by the fact that Viola has had stirrings herself for Orsino. It gets even more complicated later. “Twelfth Night” is home to some of The Bard’s most well-known comic characters such as Malvolio, Olivia’s uncle, the aptly-named Sir Toby Belch, and particularly the foppish Sir Andrew Aguecheek, capably and hilariously in the hands of Susannah Millonzi, all of whom are involved in a comic scheme for the ages. You might to revisit the piece before your visit, or you could come in cold and take your chances. The less adventurous might even want to employ a copy of the text itself – the lights pretty much stay on throughout — to appreciate the lightning-quick transitions, which come with the doffing or donning of a hat or pair of glasses, or a subtle voice change. The production is is certainly not about the mimimalist props or the non-period everyday street garb costumes, which leave nowhere to hide onstage – not that any member of the company needs it. Why does Bedlam do what it does? I suppose the easy answer is because it can, and it can, amazingly enough, even make it look easy, much like a knife-thrower continually missing his target’s groin. The Nora Theatre Company’s presentation of William Shakespeare’s “Twelfth Night.” Directed by Eric Tucker and performed by Bedlam. At the Central Square Theater through July 9. (“What You Will” ends July 10). centralsquaretheater.org.